In the busyness, technological overload, and me mindset of our world it is a challenge raising children who are thankful. Being intentional about what attributes you teach your child can have a lasting impression on them. 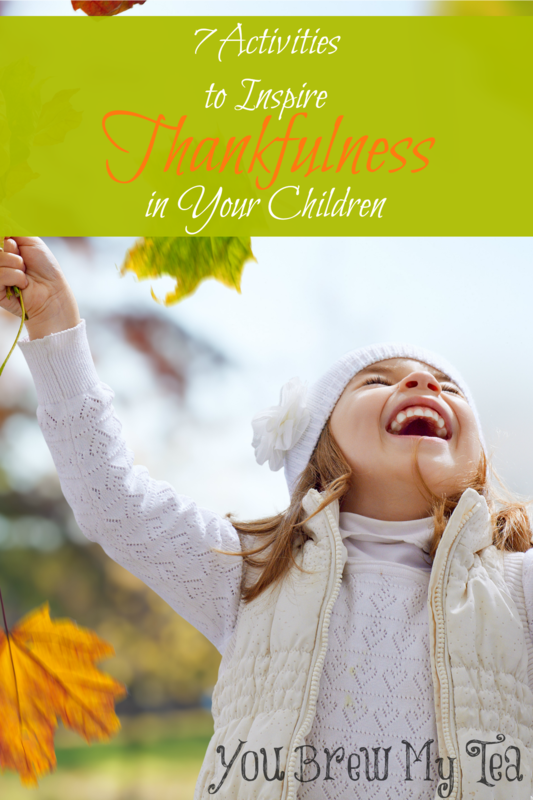 Here are 7 Activities To Inspire Thankfulness In Your Children. Include these in your daily life in the month come to help your children become more reflective of the holiday season. Model thankfulness- Anytime your child does something for you- does chores without being asked, picks up trash, helps with dinner, is kind to a sibling tell them how thankful you are for them and their helpful ways. Let them see you thanking others and visibly showing appreciation for what you have in praise, prayer or deeds. Talk about what it means to be thankful- Look up the the words online or in a dictionary- thanks, thankful, thanksgiving. If you are a homeschooling momma make this a time for a lesson. Have them write the words and define them. Talk about what it means to be thankful and how to show it outwardly, even beyond words. Make a list of things you are thankful for- You can do this in actual list form, or be creative and – write each thing on a post it note and spread all over the house, cut leaves out of colorful construction paper and write on them then tape them to a branch to create a thankful tree- check out Pinterest for additional ideas. Do for others outside the home- Find a way to do something kind for a neighbor, friend, or family member. Thinking about and doing for others increases our awareness of all we have to be thankful for as well as allowing them to see others thankful attitudes in action. Do for those in the home- Starting your quest for teaching thankfulness to your child should definitely start in the home. Encourage your child to thank others for kind deeds done and to seek out opportunities to do things in return and for no reason at all for all family members. Make Thank you cards- For gifts received recently, to send to soldiers overseas, or to drop off personally to teachers, fireman, police officers and other service personnel. Showing kids ways to demonstrate their thankfulness and gratitude will go a long way, remember actions speak louder than words. Read books about being thankful- As a book lover I need no excuse to add books to mine or my childrens library, but if you needed a good reason here is one. Not only are you helping to build their vocabulary and comprehension they will be learning lessons in gratitude. This year work these activities to inspire thankfulness in children into your daily routine. Make sure your kids know what being thankful truly is. Be good examples to them, and encourage them to do good for others who need it during the holiday season. Want some great Fall activities to do with your kids? Check out these great posts! I love the Berenstain Bears books, they teach a lot of great things! My toddler has learned many ways to be thankful and we do many nice things when we are outside of the house and inside. I want her to be kind when she grows up and knows her manners. Awesome post, thank you! These are great! I really like the idea of making a list. Perfect! I love seeing things like this. It helps remind me that even in this crazy world that we see around us, there are still some really great parents…teaching kids the right things. Awesome..thanks!